Frank Williams was born in Cardiff in January 1910 and was a hard tackling Centre. 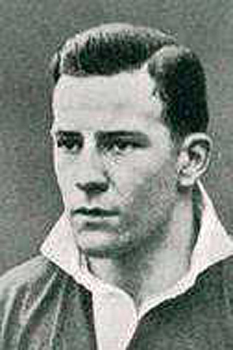 Between 1926 and 1935 he played 47 games for Cardiff and he played 14 times for Wales between 1929 and 1933. Frank was selected for the British Lions tour in 1930 but due to work commitments he had to turn down the invitation. In 1931 he played for the Barbarians – against Cardiff. While playing at Cardiff Frank became Sports Master at Wakefield Grammar School. The move to Yorkshire meant that for the remainder of his career he played for Headingly where he also represented the county. Frank Williams in Tamworth on July 7th 1959 aged 49.